Dream cut short tonight. Its all been topped, for the people who know my story. Tonight I was going north on dufferin. Get in the left turning lane to make ( obviously ) a left onto orfus road. Light is amber at this point, made a sound judgement that it was safe enough to make the turn ( cars all made a solid stop at this point so I proceeded ). Light is red and I made it 90% through, and an older gentleman hit the gas, blew the light, and hit me. Car spun 360 degrees. Wheel is on a 45 degree angle. Quarter panel is pushed in. Chasis is bent. Leaking gas. Axle snapped. Back seats are pushed in. I'm at a loss for words. Pictures on the way. thats terrible to hear, I hope you're alright though, were there any injuries? Car will most likely be written off. took detailed pictures. Coming soon. Glad you and your GF are all good. Cars are replaceable. First off br thankfull you and your woman are all right. And I'll gurantee you with that frame damage......you would'nt want your car back anyways. It would never drive the same even if they fixed it. 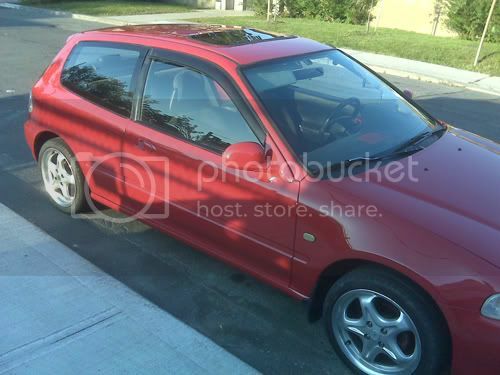 Take the check......and next civic you get don't put any altezza's on it this time. glad your alright man!.. did the cops charge anyone with anythign? my g/f got screwed when she got hit by someone when she was turning left on a amber/red light. Even though the other person smoked the red light they claimed it was still green and since my g/f was turning left she was supposed to have control at all times and it ended up being her fault. I'm glad that everyones OK though. t-boned? 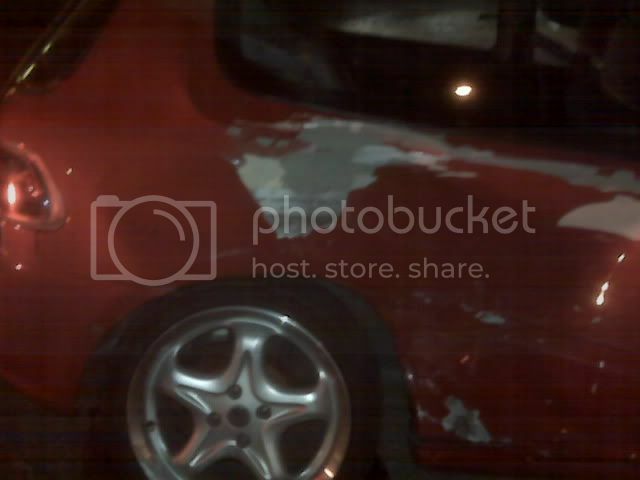 how when the damage is on the side of the car, plus look at all that bondo, just scrap it. Sorry to hear what happened to you. Hope you manage alright with the insurance, etc...there's some hassles and frustration you probably didn't need. But, repeating what others have said, very glad that you and your g/f didn't incur serious injuries. It was wise to have paramedics there to initially check things out. going off topic a bit here - I would just like to say that I always look forward to Sharona's posts on topics such as this one - I always feel you provide some good old fashioned compassion Sharona! You can tell you're sincere. Thank you! Thanks, Shaaron...that's awfully good of you to say. Hate seeing anyone go through the mess of a crash, wreaks havoc for a while--nobody needs the added stress. Last edited by Adair; 19-Oct-2008 at 05:32 PM. Where do we live, the USA? Just because you sue them doesnt mean they cant counter sue you. ^ I don't see difference between here and the US when it comes to this stuff. if you sue first you have the upper hand.